The duo will perform Idol classics, along with covers and spoken-word interludes. 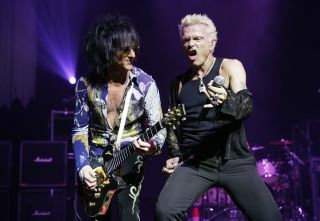 What to Remember When Performing Billy Idol's "White Wedding"
Watch Billy Idol, Steve Stevens and Derek Sherinian Perform Van Halen's "Jump"
Below, check out a pro-shot video of Billy Idol — with longtime guitarist Steve Stevens — performing "White Wedding" from Guitar Center Sessions. Steve Stevens and Sebastian Bach are performing at the Iridium in New York City this Saturday, January 28, and you can watch a live HD broadcast of the show right here at the club's Facebook page.